NAI Alliance | Commercial Real Estate Blog For Reno, Sparks, Carson, Minden and Northeast Nevada: Why might this be a great time to buy a building? Why might this be a great time to buy a building? If you have been looking to take advantage of the benefits of owning rather than leasing your commercial space (that analysis is a topic for another entire discussion, so let’s assume you‘re convinced), the stars are aligning for a very favorable purchase environment. There is no perfect situation, but great properties, with low alteration costs, in good locations, at deeply discounted prices, with attractive financing are pretty compelling. Let’s take a look at each of those in turn. In the boom years of 2004 – 2007, a common complaint we heard from buyers was that the right property for their requirement wasn’t available at any price. In stark contrast today, the Northern Nevada Industrial Market now sits at a record high 14.93% vacancy as of Q3 2009, 231 properties are available to occupy, of which 121 are offered for sale at this time. The sheer number and variety of properties to choose from is startling. One barrier to moving is the cost of altering the space to fit your operating requirements. With construction material costs falling and contractors eager to work, the cost of Tenant Improvements (T.I.s) have certainly come down, easing some of the fit-up costs of a new location. With owners eager to make deals work, negotiations often include concessions to cover the costs of deferred maintenance, specialized improvements and/or owner financing. Every deal is different, but everything is on the table for discussion these days. An unfortunate reality of this economy is that almost every sector has been hit, so buildings in every strata of quality and every corner of the market have gone vacant. As the Truckee Meadows has grown, most vacant lots close to the center of town have either been built on or priced for “higher and better uses” (real estate talk for too high). This forced many users into the far corners of our community even when a central location was highly preferable. Accordingly, some of the newest, highest quality buildings were built on the periphery of development – often those are the buildings open to the most aggressive negotiations today. Locational advantage (like beauty) is in the eye of the beholder it seems. An interesting micro trend we witness of late is the desire for residents in Spanish Springs to work closer to home. Gas isn’t free nor is your time, so now is a great time to locate your business WHERE it makes the most sense (or cents) to you. A common method of valuing buildings is called “Replacement Cost Analysis”. As the name suggests, you compute the cost of building the same structure in today’s dollars. Conventional wisdom says buildings constructed during the peak of the market should be valued less than replacement cost, and based on what we are seeing, they are. 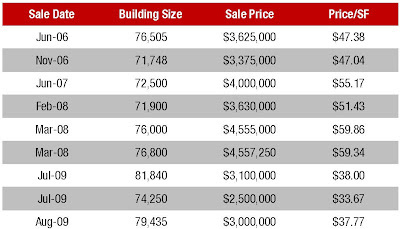 The following chart shows 9 building sale comps. All of these buildings are 70,000 – 80,000 sqft, vacant at the time of sale, sold for occupancy by a new user in either the Reno Airport or Sparks Submarkets. The average price per square foot for these sales in 2008 was $56.88, but the average price in 2009 had fallen to $36.48. This reflects a 35.86% drop in just one year in this small segment of the market. Values in all size ranges across the entire region have suffered a similar devaluation. The implementation of far stricter underwriting for commercial properties has clearly contributed to the fall in values. Financing for a purchase is undoubtedly more difficult to obtain than before, but it’s not impossible particularly for companies planning to occupy the new space. The Small Business Administration (SBA) has a number of programs available that allow 90% Loan-to-Value (LTV) for businesses in operation for 2 years or more – they even allow you to include T.I. costs and/or new equipment in some cases! Also, many loans written in years past (at better terms than currently available) are assumable. With a little calculator magic and fine print perusal, you may find the best financing vehicle comes with the property. Is Now the Right Time for You to Buy? Undeniably, any mortgage payment is too high when you’re business is under water. However, if you are still turning a profit in this challenging environment, you likely have the staying power to realize the many benefits of ownership. When considering a new building, think of a three legged stool, it should be the right building, in the right location at the right price. Today’s challenging environment has created conditions favorable to all three legs of the purchase decision. Is this the right time for you to step up and make a purchase?